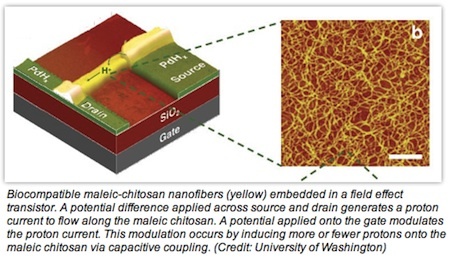 This transistor based on biocompatible maleic-chitosan nanofibers could be used to connect a device directly with biological processes that involve protons. Unlike typical transistor, this device uses protons instead of electrons. In the body, protons activate “on” and “off” switches and are key players in biological energy transfer. They open and close channels in the cell membrane to pump things in and out of the cell (proton pumps in the stomach lining that turn on acid for example). The body also uses these protons to flex muscles and transmit brain signals. If a machine could sense proton currents, it could sense biological signals directly, and if it could generate proton currents, it could even control certain functions directly. “We found a biomaterial, chitosan, that is very good at conducting protons, and allows the potential to interface with living systems,” said Marco Rolandi, a UW assistant professor of materials science and engineering. The UW scientists incorporated chitosan in a prototype field-effect transistor (includes a gate, drain, and source terminal for the current). This is the first such device to use protons, they say. It measures about 5 microns wide, roughly a twentieth the width of a human hair, small enough to be implanted. The UW device uses a modified form of chitosan (maleic-chitosan), which is created from chitin, the structural element in the exoskeleton of crustaceans (such as crabs and shrimp). The material is compatible with living things, is easily manufactured, and can be recycled from crab shells and squid pen discarded by the food industry. The researchers discovered that this form of chitosan works remarkably well at moving protons. If this research proceeds and is successful, the implants that will enhance your health and well-being will communicate directly with your body, and not simply be devices that mechanically aid body processes.